2012/06/19 - Girard-Perregaux present's the “Beverly Hills Hotel - 100th Anniversary Special Edition"
Los Angeles, California (June 18, 2012)- Iconic, luxury Swiss watch brand Girard-Perregaux is proud to partner with the Motion Picture & Television Fund and The Beverly Hills Hotel & Bungalows to celebrate its centennial anniversary the weekend of June 15th with a star-studded weekend. Exclusive, curated events featuring a celebrity hosts Warren Beauty, Bill Cosby, Brett Ratner, and Jeffrey Katzenberg and Honorary Weekend Ambassadors Warren Beatty, Clive Davis, Bryan Lourd, Brett Ratner, Rick Rosen and Ben Silverman celebrated 100 years of the hotel as an icon of the entertainment industry. The weekend kicked-off on Friday, June 15th with an evening of comedy and jazz by the pool hosted by Bill Cosby to benefit the American Comedy Fund, a partnership between MPTF and Viacom Entertainment Group. The American Comedy Fund is the first fund of its kind dedicated to assisting comedians in times of need and transition. Guests attending included Joe Torre, Tom Arnold, Kristen Bell, Barbara Davis, Martie Maguire, Carl Reiner, Rob Riggle, Dax Shepard, Barbara Davis, Nancy Davis and more. Saturday, June 16th began with a cabana-chic, vintage-style pool party featuring a special performance by DJ Matthieu Schreyer and was followed by the launch of an exhibition featuring classic photos from The Beverly Hills Hotel shot by legends of the photography world including Bruce Davidson, Anthony Friedkin, Terry O'Neil, Julius Shulman, and Julian Wasser. Robert S. Anderson, official historian and great-grandson of the hotel’s original owner, who wrote The Beverly Hills Hotel – The First 100 Years, was also on site to sign copies of the newly released book. Additionally that evening, Brett Ratner hosted an intimate cocktail celebration and dinner which premiered a short film created by Academy-award winning filmmaker Chuck Workman commemorating The Beverly Hills Hotel's 100-year anniversary, and narrated by Lauren Bacall with anecdotes from Warren Beatty, Mary J Blige, Clive Davis, Michael Douglas, Jimmy Fallon, Jeffrey Katzenberg, and Robert S. Anderson. The premier was followed with a performance by the incomparable nine-time Grammy Award-winning artist, Mary J. Blige. Guests attending included Warren Beatty, Cat Deely, Mena Suvari, Joely Fischer, Donald Faison, Zach Braff, Karina Smirnoff, Donna Mills, Francis Fischer, Stana Katic, Jeffrey Kazenberg, Michael Chow and more. Warren Beatty was also honored by Girard-Perregaux and was presented with a limited edition “Beverly Hills Hotel” timepiece for his support and role in the success of The Motion Picture & Television Fund. “We are very proud to honor the Beverly Hills Hotel and the Motion Picture & Television Fund”, said Michele Sofisti, CEO of Sowind Group (Girard-Perregaux and JeanRichard). “It is an icon within the entertainment industry, which is why we wanted to honor them with our iconic 1966 timepiece. In addition, the constant support they provide those in need is a great example of what we all can do to assist those around us”. The 1966 Beverly Hills Hotel limited edition watch was created in honor of the 100th anniversary. 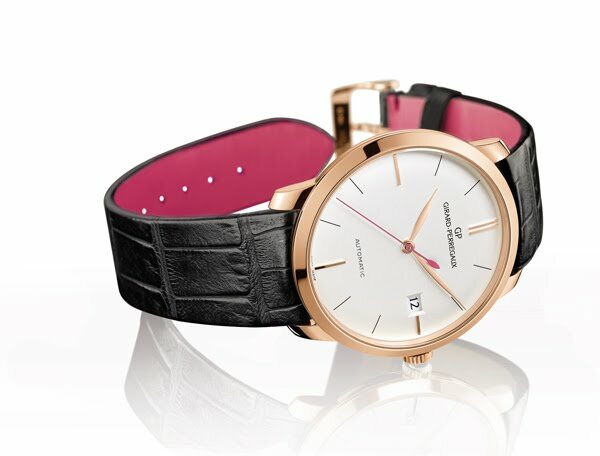 It has the option of choosing between a rose or white gold case and features a black alligator strap with a pink underside and pink second hand in honor of the “Pink Palace”. The case houses a Girard-Perregaux automatic manufacture movement and a special engraving on the back: “Beverly Hills Hotel- 100th Anniversary SPECIAL EDITION”. For 90 years, MPTF (Motion Picture & Television Fund) has served as a beacon of hope for entertainment industry members in their time of need. As a charitable organization, the MPTF provides financial assistance and services essential to the well-being of the community and is a leader in the development and implementation of services and programs for seniors and those who care for them. MPTF is supported by the generosity of corporate donors and fellow entertainment industry members who contribute their time and money because they believe in the critical importance of Hollywood Helping Hollywood. For more information, visit www.mptvfund.org.